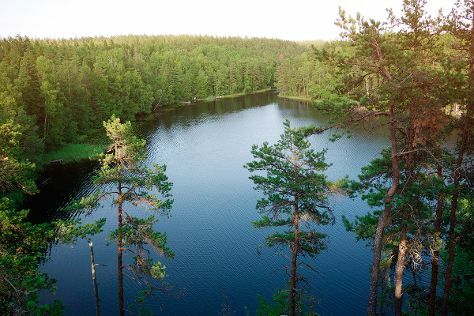 Take a break from the city and head to Nuuksio National Park and Bellevue Beach. We've included these beaches for you: Vepsa Island and Ispoinen Beach and Sauna. Take a break from Turku with a short trip to Mathildedalin Kylapanimo in Salo, about 1h 10 min away. There's much more to do: explore the galleries of Turku Castle, take a stroll through Naantali Old Town, gain insight at Turku Cathedral, and get a new perspective on nature at Turku Biological Museum. To find where to stay, ratings, photos, and tourist information, refer to the Turku trip itinerary builder site . Berlin, Germany to Turku is an approximately 7.5-hour flight. You can also drive. Traveling from Berlin to Turku, you'll lose 1 hour due to the time zone difference. In June, daytime highs in Turku are 20°C, while nighttime lows are 9°C. Finish your sightseeing early on the 27th (Thu) so you can travel to Rovaniemi. Start off your visit on the 28th (Fri): snap pictures at Lumberjack's Candle Bridge, then find something for the whole family at Santa Claus Village, then see Santa Claus Office, and finally look for all kinds of wild species at Wildlife Areas. On the next day, Head underground at Syvasenvaara Fell, then look for gifts at LAURI, then take an in-depth tour of Arktikum, and finally pause for some serene contemplation at Rovaniemi Church. To see other places to visit, maps, traveler tips, and other tourist information, use the Rovaniemi tour itinerary planner . Traveling by flight from Turku to Rovaniemi takes 5 hours. Alternatively, you can do a combination of train and flight; or drive. In June in Rovaniemi, expect temperatures between 18°C during the day and 9°C at night. Cap off your sightseeing on the 29th (Sat) early enough to travel back home.